After dealing with rumors for the better part of 10 years . . . the Spike missiles are coming. As Israel continues its pivot toward Asia, Israeli-made Spike missiles are to be used by the Philippine Navy’s first two anti-submarine helicopters. Rafael Advanced Defense Systems Ltd. produces the Spike, which was originally designed to destroy tanks. It will be employed by the Philippine Navy as an anti-ship weapon on the Agusta Westland AW-159 Wildcats that are due to be delivered to Manila by next year. The missile, capable of penetrating 39 inches of armor, can be operated in either direct attack mode or by mid-course navigation based on target coordinates only. These modes enable defeat of long-range hidden targets with pinpoint precision. Philippine Navy spokesman Capt. Lued Lincuna was quoted by the Philippine News Agency on Tuesday as saying that “the missile has a built-in camera that allows it to be operated day or night” and allows pilots to engage hostile targets beyond their visual range. 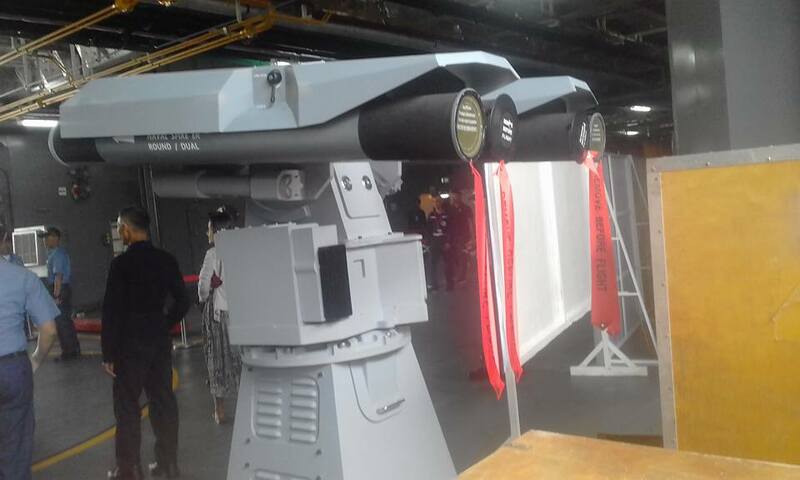 Rafael will also be providing the shorter-range Spike ER missiles, weighing 33 kg with a range of 8 km, which will be used on the navy’s multi-purpose attack craft (MPAC ). The Philippine Navy is currently operating six MPAC s, but none is armed with the missile system. Two new MPAC s, which are being built in a joint venture between Filipino Propmech Corporation and Taiwan’s Lung Teh Shipbuilding Co. and set for delivery by the end of 2017, will have mountings for Spike missiles. Description: The SPIKE-ER, formerly known as the NTD, is a multi-platform anti-tank missile with an extended range over previous SPIKE missiles. It has been designed to be mounted on ground vehicles, helicopters, and naval vessels. 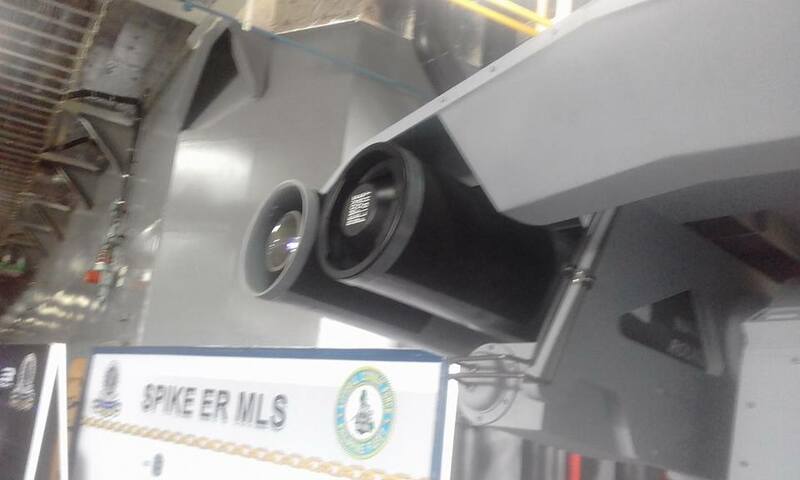 It seeker combines electro-optical sensors (IR/CCD-TV) and a fiber optic data link to achieve fire and forget and directed launch modes. Using the fiber optic data link the SPIKE-ER missile is able to perform battle damage assessment, in-flight retargeting, identification friend or foe, attacks without collateral damage and pinpoint accuracy strikes. The SPIKE-ER missile operates day/night, in all weather conditions. Its tandem warhead ensures neutralization of ERA (Explosive Reactive Armor) protected targets. A single missile launcher weighs about 58 kg, and the 4-missile launcher for helicopters weighs 187 kg. A wooden round SPIKE-ER missile weighs 33 kg. Hmm. 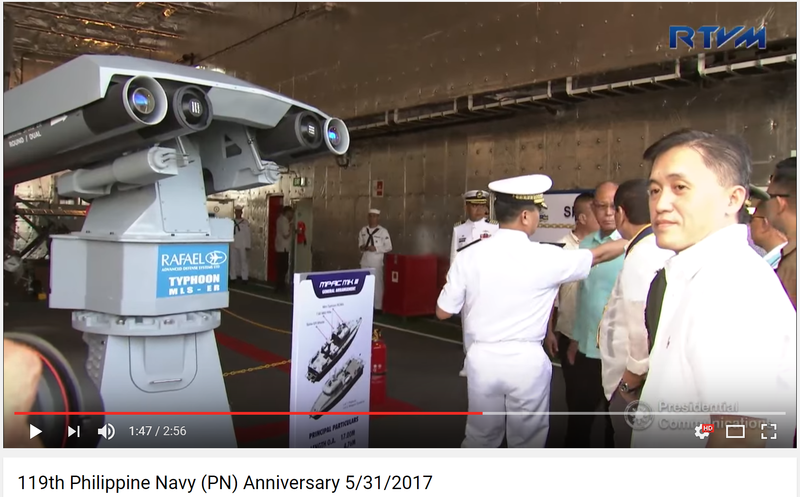 just wondering if the PN have plans or even considered installing this system with the Tarlac Class. given the problem of fast suicide boats that has a tendency of becoming a reality in our country, given that it has been reported that the maute group has already started training suicide bombers? MANILA -- Two more platforms which will help boost the Philippine Navy (PN)'s capabilities to defend the country's vast maritime domains are expected to be delivered this 2018. This was bared by Defense spokesperson Arsenio Andolong when sought for an update on other deliverable items for the PN this year. 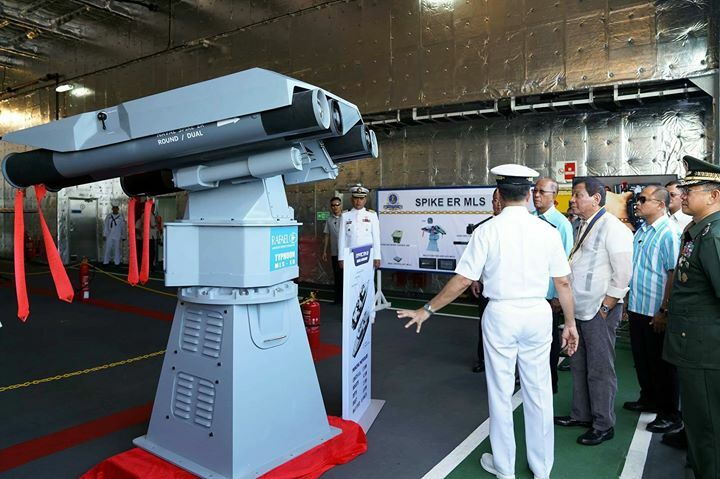 First among the deliverables is the Rafael Advanced Defense Systems Ltd's Spike ER (extended range) missile systems which will be fitted on three of the Navy's brand-new multi-purpose assault craft (MPAC) which was activated last May 22. Aside from the SSV, the Navy also took delivery of three additional multi-purpose attack craft (MPAC) last May 22. This raises the number of MPACs in PN inventory to nine. However, these naval craft are not your average MPACs as these vessels have provisions for the Rafael Advanced Defense Systems Ltd’s Spike ER (extended range) missile systems, making them the first Filipino warships to be armed with these weapons. Contract for the three ships is worth PHP270 million. The weapons are on anti-ship mode meaning it can engage surface vessel targets. It is capable of penetrating 1,000 mm (39 inches) of rolled homogeneous armor and has a maximum range of five miles. 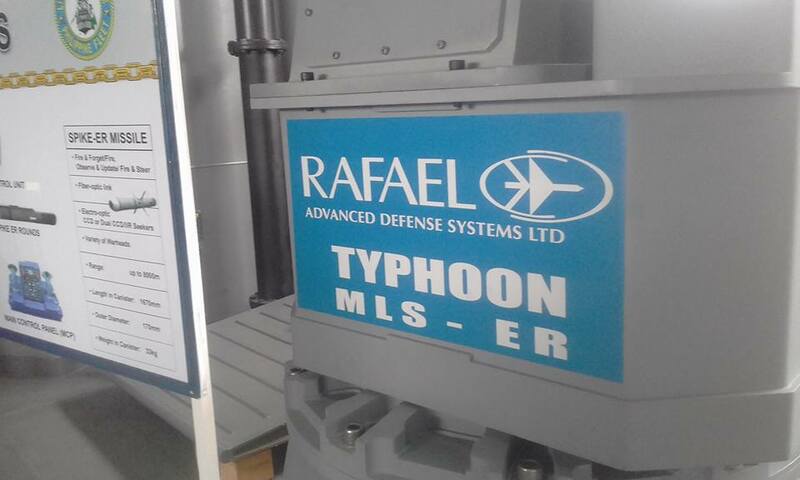 This week the Philippine Navy (PN) received a shipment of Spike-ER missiles, Typhoon MLS-ER launchers and Mini Typhoon 12.7mm RWSs from Rafael in Israel, destined for installation aboard three Multi-Purpose Attack Craft (MPAC). MANILA - The Philippine has completed the purchase of its first-ever ship-borne missile systems, boosting its maritime deterrent as part of a military modernization program, defense and navy officials said on Wednesday. The Israeli-made Spike ER missiles were fitted on locally manufactured gunboats, known as multi-purpose attack craft, said Arsenio Andolong, defense department spokesman. It is unclear when the short-range surface-to-surface, surface-to-air missile systems will become operational. "It will be a deterrent because, this time, we have a credible armament that can strike a punch whether the target is a small or large ship," said the commander, who declined to be identified because he is not authorized to speak to the media. MANILA -- The Department of National Defense (DND) is looking into the possibility of arming the Navy’s multi-purpose attack craft (MPACs) with the Israeli-made Spike-ER surface-to-surface missiles. "The idea is still under consideration," DND spokesperson Arsenio Andolong said Friday when asked about the feasibility of arming all operational MPACs with missiles to boost their capability. Spike-ER missiles are capable of penetrating 1,000 mm. (39 inches) of rolled homogeneous armor and have a range of 8 km. As of this posting, the Navy has nine MPACs in its inventory with another three units planned. Three of these craft are being fitted with Spike-ER missiles and launchers. These naval craft were activated on May 22, 2017 and were manufactured by Subic-based Propmech Corp. for PHP270 million. The Spike-ER surface-to-surface missiles, along with their launchers, arrived third week of April. After the installation, the Spike-ER missile systems will go through the Technical Inspection and Acceptance Committee, he added. MANILA -- The Philippine Navy’s (PN) first three Spike-ER armed multi-purpose attack crafts (MPACs) will be fully operational within two to three months, flag-officer-in-command Vice Admiral Robert Empedrad said. Integration or installation is ongoing as of this time, he said Thursday, adding that they are studying the doctrine on to how to use and where to deploy these missile-armed MPACs. The Spike-ER surface-to-surface missiles, along with its launchers, arrived third week of April. These missiles are capable of penetrating 1,000 mm. (39 inches) of rolled homogeneous armor and have a range of 8 km. As of this posting, the Navy has nine MPACs in inventory with another three units planned. Three of these seacrafts are being fitted with the Spike-Er missiles and its launchers. MANILA -- Once installed and fully operational, the Israeli-made Spike-ER surface-to-surface missiles will be useful in protecting the country's vast maritime territories and sealanes of communications. This was disclosed by Philippine Navy (PN) flag-officer-in-command Vice Admiral Robert Empedrad in an interview Sunday. The weapons, are now undergoing integration on three of the Navy's multi-purpose attack crafts (MPACs), will greatly deter shipborne intruders trying to violate the country's waters. "The (Spike-ER) missiles are very accurate and I'm sure (that once it is up and running) it can threaten intruders aside from securing the choke points (of our) sealanes of our maritime nation," Empedrad added. The Spike-ER missiles along with its launchers arrived on the third week of April. It is the first missile system to be acquired by the PN. These missiles are capable of penetrating 1,000 mm (39 inches) of rolled homogeneous armor and has a range of eight kilometers. As of this posting, the Navy has nine MPACs in inventory with another three units planned. Three of the above-mentioned craft are now being fitted with the Spike-Er missiles and its launchers.